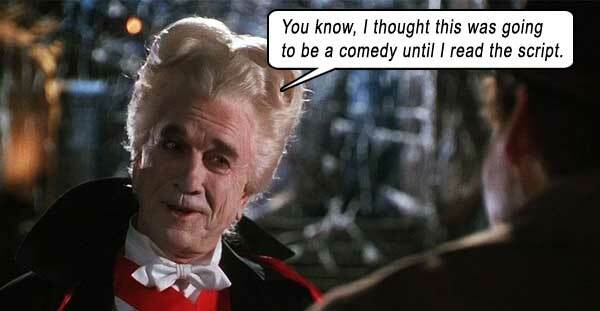 In DRACULA: DEAD AND LOVING IT, Leslie Nielsen is the vampire Count Dracula. We presume this retelling of Bram Stoker’s tale is a comedy. We presume wrong, as writer-director Mel Brooks steers it as far from funny as Disneyland is from Transylvania. One would imagine the comic radar of the genius auteur who helmed BLAZING SADDLES, HISTORY OF THE WORLD PART I and YOUNG FRANKENSTEIN (this movie’s closest analog and a wildly successful parody) would be so finely-attuned that he might have perceived DEAD AND LOVING IT was – like its eponymous anti-hero – dead on its feet. He did not, which reveals something terribly askew in the Brooks universe. No longer is it “good to be the king.” Mel Brooks may well be a 2000 year-old man these days – but not in a good sense; his tastes no longer run congruent with his audience’s; his comedy no longer as energetic or as biting as the wit of his youth (which, relatively speaking, was his late-40s anyway). The Brooks gag formulas are definitely still there, but seem lazily inserted as dependable fallback material, rather than inspired stylistic substance. Jokes which 15-year-olds used to repeat ad nauseam on the schoolyard now fall flat and wearisome on inured sensibilities. Not only does DEAD AND LOVING IT suffer from rehashed and lazy gags, Brooks’s direction lacks cohesion; wide shots, reverses and close-ups which serve no purpose, camera blandly flitting from one unnecessary shot to the next, not merely misdirecting our eye, but searching for subject matter to fill the frame judiciously. These sore thumbs stick out and detract from the already-sparse humor. 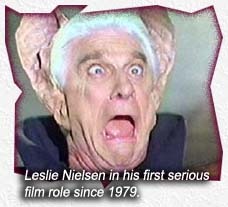 On paper, Leslie Nielsen’s Dracula seemed like a hilarious coup, as did Mel Brooks’s Dr. Van Helsing, but both seemed to be laboring under the specter of their own reputations as funnymen. Nielsen works best when he plays straight, oblivious to his own humor, but here he actively goes for laughs, which means that either Brooks doesn’t know how to work Nielsen or disastrously opted to make Nielsen play against his forte. And Brooks’s Van Helsing is too self-aware of every mispronunciation he makes – for the sake of schoolyard quotes – to be genuinely funny. During the cast-and-crew screening for this film, one has to wonder whether there were any genuine laughs or whether the aura of the director’s past glories tainted the crew into believing they had a good comedy on their hands, thereby eliciting perfunctory giggles out of respect for their elders. 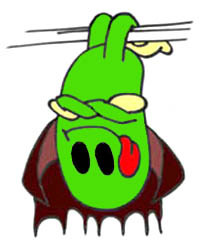 In this film’s adherence to the original Dracula story – and noticeable neglect of comedic opportunities – not only does it fail as a comedy, it is barely convincing as an A-movie. Brooks need not remake DRACULA; droves of filmmakers have done so before him, with varying success. But Brooks ignores his own strong suit – satirical comedy – and tries to “re-vamp” the tale of the infamous psychotic blood-drinker, sprinkling it so thinly with jokes that they seem incongruous within the context of this morbid tale. Where we expect punchlines, there are scene fades; where we expect gags, there is exposition; where we expect laugh-out-loud-slapstick, there are strained attempts at plagiarizing from his past. The actors vacillate between parodying Victorian characters and actually playing them. Harvey Korman’s Dr. Seward can almost be an actual over-actor from a “real” DRACULA movie, whilst Steven Weber’s Jonathan Harker frequently comes across as an exaggerated English nobleman from a Christopher Lee film. Peter MacNichol makes the perfect Renfield – for any DRACULA film, serious or spoof – and is the only actor who truly nails his role in this blunt-toothed parody. Amy Yasbeck and Lysette Anthony are just too damn hot to be funny: all the self-deprecating melodrama in the world is not gonna help, chickie-babes – look at those racks! Writers: Bram Stoker, Rudy De Luca, Steve Haberman, Mel Brooks. Starring: Leslie Nielsen, Steven Weber, Harvey Korman, Amy Yasbeck, Lysette Anthony, Mel Brooks.